With everyone’s favourite children’s entertainer, Dwayne “The Rock” Johnson playing the hero of the piece, Hercules, we have been sent the first, teaser, trailer from the film as well as, well… You will just have to read on to find out what that could be. According to the synopsis, found at the bottom of the piece, it is set in a world where the supernatural doesn’t exist. That maybe true but watching the trailer it does seem that it’s not only physics that is taking a small holiday. The sets seem to be re-used from something like Conan or Clash Of The Titans. The costumes from the latest, or possibly the first, 300 film. With no supernatural things happening it is strange that we see the three headed hell hound, Cerberus or two headed serpents that attack our hero around 30 seconds into the teaser. This ignoring the eight to ten foot high wild bore that tried to run-through our hero with a tusk or four! But then again, theses ain’t supernatural, just mythical creatures! D’oh! That means they don’t count as supernatural – whatever that means in this context! To go with the trailer, we have been sent two images from the film to wet your appetite. It seems to be a sure-fire hit with the calibre of cast it has. You have to ignore Dwane when I say that 😀 , it has the likes of John Hurt, who we last saw as “The War Doctor” and Lovejoy, Ian McShane. It released at the start of the summer blockbuster season so expect it to do good business depending what will be released around it. Fingers crossed it doesn’t get “mysteriously” bumped to August because the studios have got cold feet with better, sequels or a Marvel / DC character’s film is out. It is, as well, continuing the fad of making films in 3D so to cash in on the extra money that comes from this format. I don’t think this will make any of the storytelling any better apart from seeing splintering trees, arrows, the occasional spear and the like being thrown into the crowd. It may bring the size of some of the “sets” into a better sense of scale that 2D cannot convey. Based on Radical Comics ‘Hercules’, this ensemble-action film, featuring an international cast, is a revisionist take on the classic myth set in a grounded world where the supernatural does not exist. 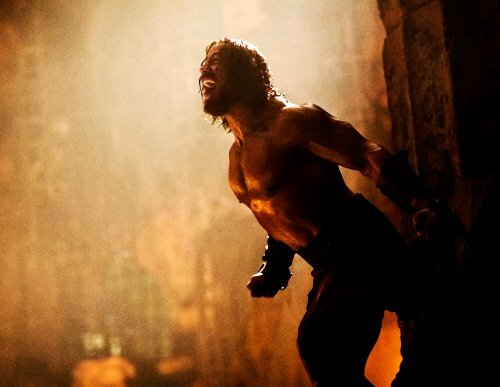 Hercules also stars Ian McShane, Rufus Sewell, Joseph Fienns, Peter Mullan and John Hurt.